Paul Howard is a multi-award-winning journalist, author and comedy writer. He is best known as the creator of Ross O’Carroll-Kelly, a fictional rugby jock whose exploits have been the subject of fourteen books, which have sold over one million copies in Ireland. He is a three-time Irish Book Award winner, collecting the Best Popular Fiction prize for ‘Should Have Got off at Sydney Parade’ in 2007, ‘The Oh My God Delusion’ in 2010, and ‘Downturn Abbey’ in 2013. He is also the author of three hugely successful Ross O’Carroll-Kelly plays, including ‘The Last Days of the Celtic Tiger’ in 2007, ‘Between Foxrock and a Hard Place’ in 2010 and ‘Breaking Dad’ in 2014, all of which enjoyed long sell-out runs and remounts in Dublin and Cork. In 2012, he wrote the script and the song lyrics for ‘Anglo the Musical’, a hugely successful Avenue Q-style, puppet-based, comedy musical about the collapse of Ireland’s banks. His satirical football memoir, ‘Triggs – The Autobiography of Roy Keane’s Dog’, was a number one bestseller in 2012 and was shortlisted for an Irish Book Award. 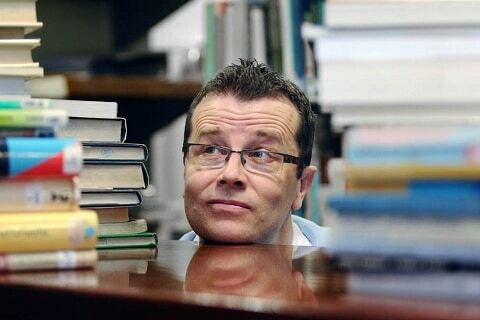 He has been described by the Irish Times as “Ireland’s pre-eminent satirist” and by the Irish Independent as “one of the world’s funniest writers”. He was named National Newspapers of Ireland Columnist of the Year in 2013 for his weekly Irish Times column, written under the Ross O’Carroll-Kelly pseudonym. Before he embarked on a career as a comedy writer, he was one of Ireland’s most respected sports journalists, working mostly for The Sunday Tribune, covering World Cups, Olympic Games and numerous other major sporting events. He was named Irish Sports Journalist of the Year in 1998 for an investigation into eating disorders among Irish athletes and an interview with the disgraced former sprinter, Ben Johnson. He was also shortlisted for the award in 2002, 2003, and 2004. Additionally, he is the author of several best-selling non-fiction books, including ‘The Joy’ (the true story of an inmate’s life in Dublin’s Mountjoy Prison), ‘The Gaffers’ (an account of the fractious relationship between Roy Keane and Mick McCarthy) and ‘Hostage’ (a book about the IRA kidnappings in the 1970s and 1980s). He also ghostwrote the autobiographies of boxer Steve Collins (‘Celtic Warrior’) and broadcaster George Hook (‘Time Added On’). He has written comedy for radio and television and was part of the creative team for two RTE comedy sketch shows in both 2012 and 2013: ‘Irish Pictorial Weekly’, in which he also appeared, and ‘The Mario Rosenstock Show’. In February 2014, ‘Irish Pictorial Weekly’ was nominated for an Irish Film and Television Award. In 2013, he completed his first film script, ‘Just Not Cricket’. Paul is a humourous and entertaining speaker where he performs as the hilarious Ross O’Carroll-Kelly and tells the story of the character. Paul is available for after-dinner events and corporate entertainment.